Selling your house involves one of the biggest financial decisions you will ever make. Working with an experienced Realtor® at RE/MAX Realty Access is a great way to begin the home selling process. Our Realtors® possess the knowledge, technology, training, experience and desire to help you achieve a common goal. To sell your house for the most money in the shortest time, with the least amount of inconvenience to you! 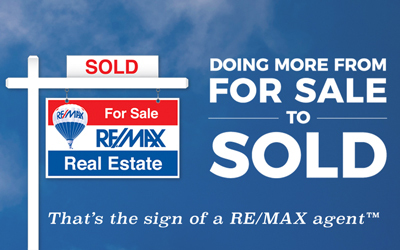 Your RE/MAX Realty Access Realtor® will represent your best interests through every step of the sales process. Your Realtor® will listen to your needs and understand the market in which you are selling a home. They will be experts in marketing, negotiation, transaction forms, and finance options, as well as have a thorough understanding of technology and how it can enhance the marketing and sale of your home. Price – Determining the right price is the most important part of achieving the highest return in the least amount of time. There are a lot of factors that go into determining a home’s value, such as the sales price of nearby homes that have recently sold, the listing price of similar homes that are currently on the market, as well as the condition and location of a home. In order to determine pricing, your Realtor® will provide a comparable market analysis which walks you through what your home is worth and why. Preparing to Sell – You really only get one chance to make a first impression. Curb appeal is for real! Do what you are able, within your time and budget to enhance the front of your house. Buyers must like it enough to desire a look inside. Fresh paint, clean carpets, reduced clutter and some depersonalization help maximize showing opportunities. Home Warranty - A home warranty is like an insurance policy that covers some or all of the costs to repair or replace certain appliances or systems of a home. In some transactions a seller might elect to purchase a home warranty that will cover the home while it is on the market and will provide the buyer with peace of mind by having coverage for one year from the date of closing. Marketing Your Home – Our comprehensive marketing plan for your home will help attract the interest of the right buyer. We will place your house in the West Penn Multi-List, promoting it to thousands of agents from most major real estate companies. Today, the vast majority of homebuyers use the internet in their home search, so your marketing plan will include focused online activities on many websites, including remax.com and realtor.com. We will place the RE/MAX yard sign, among the most recognized real estate symbols in the world, in your yard. Home Showings – When your home is on the market it has the potential to be shown at any time. It’s important to maintain a certain level of preparedness, clear dishes from the sink, make beds, put away laundry and vacuum and dust regularly. It’s a good idea for the owner’s to leave the house for any showings. This allows the buyers and their agent to discuss the house comfortably during that time. Agreement of Sale - When an offer on your house has been made by a buyer and accepted by you, you both enter into a legal contract. This document is referred to as the Agreement of Sale and it outlines the specific terms and conditions of the transaction. Inspections - A home inspection gives the buyer more detailed information about the overall condition of the home prior to purchase. In a home inspection, a qualified inspector takes an in-depth, unbiased look at your home to evaluate the physical condition: structure, construction, and mechanical systems. Identify items that need to be repaired or replaced; and estimate the remaining useful life of the major systems, equipment, structure, and finishes. Appraisal – The buyer’s lender will order an appraisal to make sure the purchase price is in line with the property’s value. The appraised value of a home is an important factor in the loan underwriting process. The loan to value ratio is based on the appraised value and helps lenders determine how much money may be borrowed to purchase the property and under what terms. Closing - Once all contingencies have been met, your closing will be scheduled. Prior to closing the buyer will do a final walk-through of the property to make sure that everything is in the condition agreed to in the agreement of sale. The day of closing, your Realtor® will be there to represent you and answer any questions you may have. We're dedicated to making the listing/sale of your house professional and successful! Complete the form below to get started. We look forward to working with you.